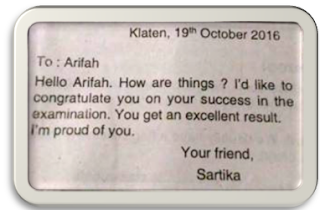 Berikut ini adalah contoh soal UTS mata pelajaran Bahasa Inggris Kelas 7 Semester 1. Soal ini dapat dijadikan sebagai referensi dalam menghadapi ujian Ulangan Tengah Semester (UTS) Bahasa Inggris Kelas 7 SMP/MTs. Choose the correct answer by crossing (x) a,b,c, or d.
I am Thurteen years old. 1. How old is Yuviter Pradeska? He is .... years old. Text for questions number 5 - 8! 6. Where will they study together? 8. When will they study? Text for questions number 9 - 11 ! 9. Who is the sender of the card? 10. "I am really proud of you "
11. Why is Sartika really proud of Arifah? Text for questions number 12 - 14 ! 12. How many pens will Diana buy? 14. How many pairs of socks does she need? She needs... socks. ,br>What is the purpose of the notice? Text for questions number 16 - 19 ! 16. Why should all scout members come to school? 18. What should they bring to school on saturday afternoon? 19. 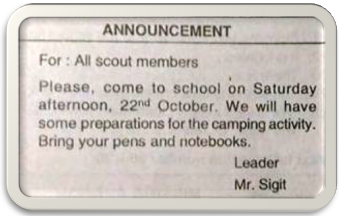 "Bring your pens and notebooks". A: What time does Tiara go to school? Demikian contoh soal UTS SMP kelas 7 Mata Pelajaran Bahasa Inggris.